If you care to know the usual, I was born and raised in the Pacific Northwest. I currently live in the Sonoran Desert with The Other Lamm, three furry creatures (only one of which is an honorary dragon), and a variety of musical instruments. I write for the love of storytelling. I’m addicted to fantasy, ghost stories, and anything with just the right amount of eerie romance. 1. Tell us about your novel Titan Magic in your own words. What does it mean to you? J: To me, Titan Magic is about identity. All of its characters struggle to find their places in a tangled web of relationships. I think the most obvious example of this is Marcus and Maddy. They have no idea what they are to each other or what they mean to each other, and part of their story is their struggle to find out. Jas, in particular, hates what he is and the role he is expected to play. His entire story is about his futile attempts to change his identity. 2. Who was your favorite character to write about, and why? J: My favorite character to write was probably Marcus, although Will is a close second. They were both so alive that writing them felt automatic. I knew any scene involving either of them would be a breeze to get through. They just made it so easy. 3. Have you always wanted to be an author? J: Writing has been a bad habit of mine since I was a small child. My parents tried so hard to get me into a more social hobby, but it didn't work. I would stay up until way past my bedtime secretly writing my fantasies onto crumpled notebook paper until my hands hurt from it. I didn't aspire to share what I'd written until I became an adult. Writing, for me, was mostly a way to remember the stories I told myself. 4. Do you write with music, or without it? J: It depends on my mood. I guess I'm fickle like that. Sometimes I must have silence. Sometimes I'll go crazy without music in the background. Sometimes I need music to get me through the more difficult bits—the unpleasant or overwhelming scenes. For the most part, I prefer instrumental music for writing, or at least music with which I am so familiar, the words won't get in the way. 5. Look to the right of you, name the first thing you see. Add ‘woman’ behind the name of the item, and that’s your new super hero name. What is it, and what are your powers based on this name? J: Library Book Woman. Umm… My superpower is the ability to know the contents of every library book I touch. Ohmygosh! That would be the coolest ability ever. Now I want it for real! 6. If you could switch bodies with 1 person in the entire world for a day, who would it be and why? J: Does it have to be a person? I want to be uploaded into a computer so I can run mad and play with deadly neurotoxin. *grin* That's my post-Portal answer. Seriously, though, I think I would LOVE to be a bodiless consciousness. So I guess the best answer (assuming I have to follow the rules and pick a person) would be that I would switch bodies with someone who was ill or suffering. Then they could have a day with less pain, and I would better appreciate my own body when it came time to switch back. Winner will be chosen at random and emailed, and will have 48 hours to reply back, or a new winner will be chosen. Jodi, love the book cover! Thanks for the great interview (and the fun questions, Ashley). The book sounds really good! It looks like an interesting read! It has a beautiful cover design. That alone makes me want to own it! We always struggle to find our identity, is really hard when your are growing up but at the end you find yourself, i'm looking forward to read this book! Thanks for the chance! I'm really intrigued by the plot, so I can't wait to read it! Thanks for the giveaway! Sounds like a good book i added it to my book list! 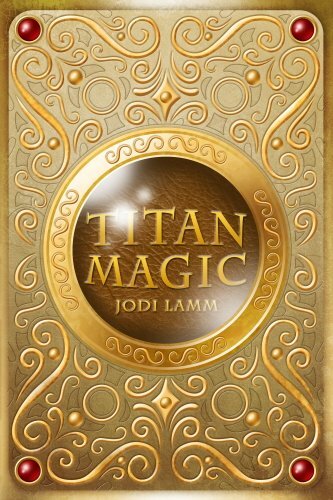 The title Titan Magic seems to indicate it has something to do with Greek mythology, and since mythology is one of my fave sub-genres, it definitely seems like something I'd want to read!